When jobs go away, Americans turn to their libraries to find information about future employment and educational opportunities. This library usage trend and others are detailed in the 2010 "State of America’s Libraries" report, released by the American Library Association. The report shows that Americans have turned to their libraries in larger numbers in recent years. 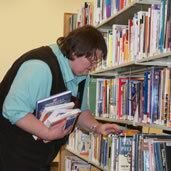 Since the recession took hold in December 2007, the local library, a traditional source of free access to books, magazines, CDs, and DVDs, has become a lifeline, offering technology training and workshops on topics that ranged from résumé-writing to job-interview skills. The report shows the value of libraries in helping Americans combat the recession. It includes data from a January 2010 Harris Interactive poll that provides compelling evidence that a decade-long trend of increasing library use is continuing—and even accelerating during economic hard times. This national survey indicates that some 219 million Americans feel the public library improves the quality of life in their community. And with more businesses and government agencies requiring applicants to apply on line, job-seeking resources are among the most critical and most in demand among the technology resources available in U.S. public libraries. Two-thirds of public libraries help patrons complete online job applications; provide access to job databases and other online resources (88%) and civil service exam materials (75%); and offer software or other resources (69%) to help patrons create résumés and other employment materials. However, the report also shows that increased library use did not lead to an increase in funding for libraries. Research by the ALA and the Center for Library and Information Innovation at the University of Maryland suggests a “perfect storm” of growing community demand for library services and shrinking resources to meet that demand. While library use soars, a majority of states are reporting cuts in funding to public libraries and to the state library agencies that support them. For more information please view The State of America’s Libraries, 2010. It is available online at The American Library Association.